The Mellon Graduate Program in Community-Engaged Scholarship is an initiative of Tulane’s Office of the Provost and School of Liberal Arts. 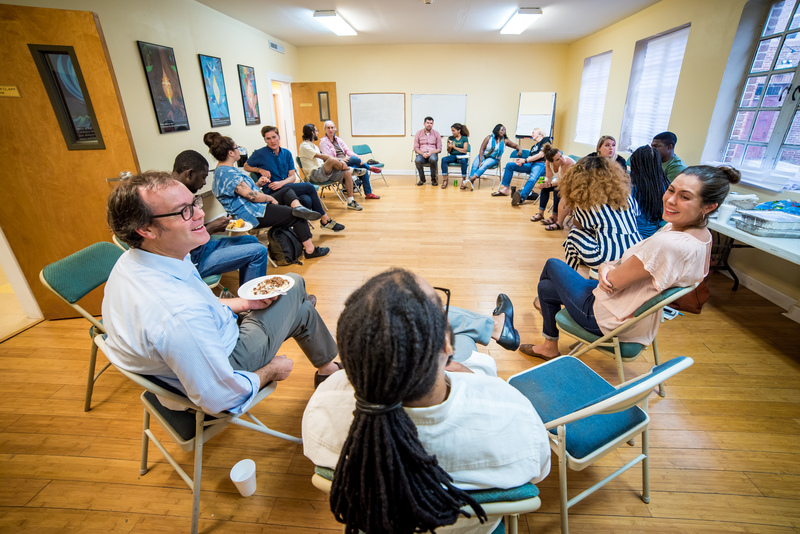 The program was launched in 2017 in conjunction with a 1.5-million-dollar grant from the Andrew W. Mellon Foundation, following three years of pilot graduate programs in community engagement at Tulane. Through the “Transforming Graduate Education through Engaging the Community” grant, Tulane is building on its strength as a campus rich in community-engaged faculty from a wide range of departments as well as its strength as an institution with over six hundred established community partnerships in New Orleans and globally. Each year a dozen Mellon Fellows are selected from incoming and current graduate students in humanities and arts programs to participate in an interdisciplinary graduate certificate program in community engaged scholarship. Those graduate students are joined by four faculty members and four community leaders who work with the graduate students as mentors and co-educators for two years. The program begins in the fall with a cohort retreat aimed at learning about the practices surrounding community-engaged scholarship. During the following two semesters, two one-credit courses build on our conversations with theories, methods, and examples of community-engaged scholarship. These courses are designed to be rigorous but not onerous—they are set up to allow graduate students to take them in addition to their regular course loads without slowing progress toward their graduate degrees. In addition to coursework, Mellon Graduate Fellows pursue projects in community-engaged scholarship. These projects resonate with graduate students’ personal and scholarly interests and are grounded in a sustained collaboration with a community partner. Graduate Fellows are provided a stipend and budget for their projects that includes compensation for community partners, additional mentors, travel, and supplies. During the final semester of the two-year certificate program, graduate fellows work with their cohort to reflect upon, evaluate, and develop next steps for their community-engaged projects as part of a third one-hour course which culminates in the production of a portfolio and a public presentation during a student-planned symposium. Along the way students will also take three graduate courses designated as having a community engaged component. Mellon Fellows receive $5000 stipends each year (in addition to any departmental stipends they may be receiving). Applicants must be students in participating graduate programs in Tulane’s School of Liberal Arts. Incoming MA and MFA students are eligible to apply as are incoming, first-, or second-year students in Ph.D. programs. 1. One-page letter of interest. 2. A brief note of support from your graduate advisor (one paragraph – emailed from your graduate advisor to Ryan McBride at rmcbride@tulane.edu). Applications are due May 15. APPLY HERE. 1. Complete Application Cover Sheet. 3. Please explain why the Mellon program interests you, how you see the connections between community-engaged work and your personal academic work and/or your discipline, and what you hope to get from the experience. 1-2 pages. 4. Email all materials to Ryan McBride at rmcbride@tulane.edu by March 31st, 2019. Mellon Fellows receive $5000 annual stipends. Tulane faculty with regular appointments at any rank may apply. 2. Resume or Curriculum vitae. 3. One-page letter of interest. 1-2 pages. 4. Email all materials to Ryan McBride at rmcbride@tulane.edu by March 31th, 2019. Mellon Fellows receive $5000 annual stipends.